The species’ name originates from the fact that historically whalers considered right whales the “right” whale to hunt: they yielded high quantities of oil and baleen, and were easy to catch and process because they were found close to shore, swam slowly, and floated when they were dead. As a consequence, they were hunted to the brink of extinction almost everywhere that they occurred. North Atlantic right whales and North Pacific right whales have never recovered from the centuries of whaling that reduced their numbers, but most southern right whale populations are now on the increase. There are three recognized species of right whales that occur in different parts of the world, as shown in the map below. These are Southern right whales (Eubalaena australis), North Atlantic right whales (Eubalaena glacialis) and North Pacific right whales (Eubalaena japonica)1. While they differ genetically, and in conservation status, they do not differ significantly in their external appearance. 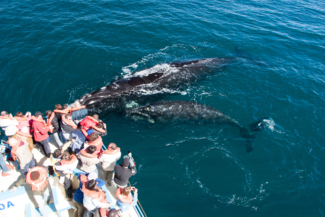 Today they are the focus of many whale watching ventures in the southern hemisphere, where they can often be viewed from shore as well as from boats. From a distance, the tall bushy, V-shaped blows of right whales could be confused with those of humpback whales. At closer range, however, the right whale is easy to distinguish from any other species due to the lack of dorsal fin, pronounced arch of the lower jaw, and the unmistakable presence of callosities on the head. While the curved mouth-line and smooth back are similar to those of bowhead whales in the Arctic region, the two species’ ranges currently do not overlap, and bowhead whales do not have callosities. North Atlantic right whales (E. glacialis) are native to the following countries and territories: Bermuda; Canada; France (Saint Pierre and Miquelon), Greenland; Iceland; Ireland; Norway; Portugal (Mainland, Azores, and Madeira); Spain (Mainland and Canary Islands); United Kingdom; United States (East coast). 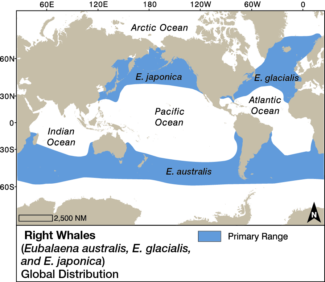 North Pacific right whales (E. japonica) are native to the following countries and territories: Japan; Russian Federation; United States (West coast). Like most baleen whales, right whales undergo seasonal migrations between summer feeding grounds and the winter breeding grounds where they calve and mate. North Atlantic right whales are now concentrated along the Eastern coast of the United States and Canada, with their summer feeding grounds extending as far north as the Scotian Shelf and the Bay of Fundy, and their winter calving grounds occurring off the coasts of Georgia, and Florida (see figure to the right). Southern right whales feed in sub-polar waters around the Antarctic and calve and nurse their young along the southern coasts of South America, Southern Africa, Australia and New Zealand. Right whale global distribution. Adapted by Nina Lisowski from Würsig,B., Thewissen, J.G.M. and Kovacs, K.M. Editors (2018) "Encyclopedia of Marine Mammals", 3rd ed. Academic Press, Elsevier: San Diego. CA. Copyright Elsevier: http://www.elsevier.com. Right whales feed almost exclusively on zooplankton, taking advantage of whatever species is abundant in their high latitude summer feeding grounds. 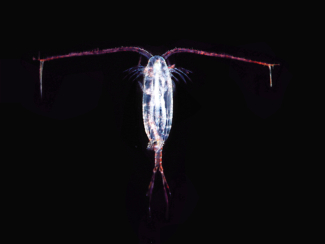 North Atlantic right whales predominantly feed on copepods (crustaceans approximately the size of a grain of rice)2,3, while krill are likely to form a more important component of Southern right whale diets2. Right whales often skim feed at or just below the water surface, slowly swimming through clouds of plankton with their mouths half open and then straining the plankton through their long baleen plates. But they can also feed at depth, and are known to surface with mud on their heads after a bout of bottom feeding2. Southern right whale feeding in Argentina. Photo courtesy of Chris Johnson. 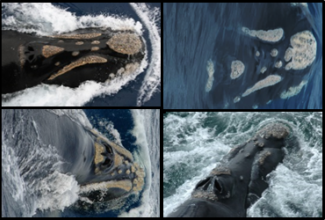 Much of what we know about right whales today has been learned through photo-identification studies, in which individual whales are photographed and recognized over time by the unique patterns of the callosities on their heads. Individual identification is now also often conducted through genetic sampling and matching of individuals. The North Atlantic right whales that feed off the northeastern coast of the United States and the southern right whales off the Peninsula Valdes in Argentina are two of the best–studied populations, with accumulated data on several generations of whales5,6. In addition to individual identification studies, results from satellite telemetry (the attachment of small devices that send the whales’ GPS position and sometimes more detailed dive information) to satellite receivers) allow researchers to track whales’ movements and gain more insight into their (seasonal) migrations and fine-scale use of habitat on the breeding grounds and feeding grounds7,8. More information about research techniques used to study whales and dolphins can be found here. There is no reliable information on natural predators of this species, although in the Southern Hemisphere, whales off the Peninsula Valdes in Argentina suffer potentially significant impacts from seagull attacks, which leave open wounds that can become infected13. The two most pervasive threats for endangered North Atlantic right whales are entanglement in fishing gear and ship strikes. 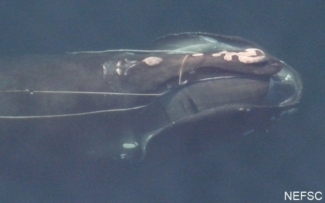 More than 60% of North Atlantic right whales have scarring that indicates some interaction with fishing gear9. Some individual whales have carried rope and bits of gear on their bodies for months or years, eventually experiencing long slow deaths from infected wounds or lost feeding opportunities caused by the gear10. Additionally, a number of North Atlantic right whales are killed each year from ship strikes as their feeding grounds overlap with major shipping lanes, particularly off the northeast coast of United States.11 Recent regulations enforcing a reduction in vessel speed in areas of known right whale habitat may be helping to mitigate this threat12 . Right whales were one of the first species of whale to be hunted, starting as early as the 11th century14. They were considered the ‘right’ whales to hunt, because they were slow, occur close to shore, float when dead, and yield large quantities of oil and baleen. The species was hunted to the brink of extinction almost everywhere it occurred until it was protected under the first International Convention for the Regulation of Whaling in the 1930’s. North Pacific right whales have never recovered from this intensive whaling and are considered Endangered on the IUCN Redlist. Sightings of the species are extremely rare, with almost nothing known of the species’ current distribution or numbers. An abundance estimate for the Bering Sea and Aleutian Islands was only 31 individuals, with an estimated 8 breeding females15, while estimates generated for the migration route western north Pacific range between 416 and 1147. 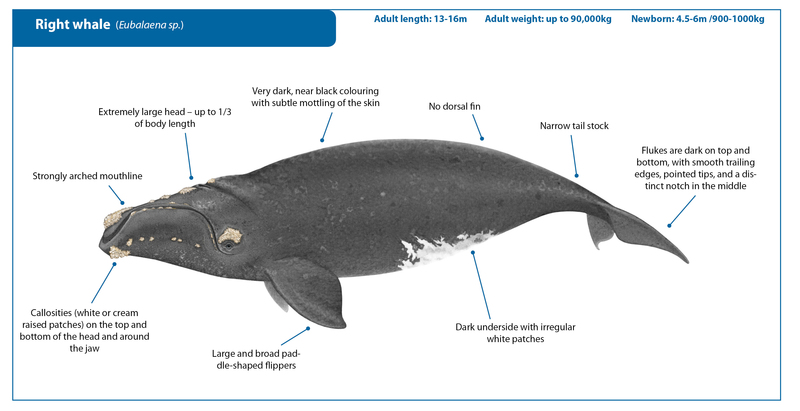 North Atlantic Right whales are also considered Endangered, with the western North Atlantic population currently estimated at roughly 500 individuals. There are only occasional sightings of right whales elsewhere in the North Atlantic. The population increased from 270 individuals in 1990, but is most likely in decline again since 201016. There is particular concern about further decrease following an unusual mortality event with a high number of deaths in 2017. 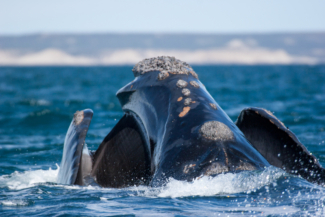 Southern right whale populations breeding off the coasts of Argentina Uruguay and Brazil (southwestern Atlantic), Australia and South Africa have been growing at rates of up to 7-8% per year since the cessation of hunting 17,18. 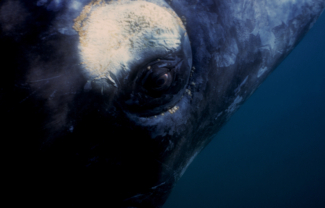 As a consequence southern right whales are globally designated Least Concern on the IUCN Redlist, but sightings of animals of the southeastern Pacific population are rare and it is considered Critically Endangered. The southeastern Pacific and southwestern Atlantic populations are the subject of IWC Conservation Management Plans. Entangled Northern right whale. Photo courtesy of NOAA, NEFSC. Professional response team disentangle a Southern right whale, False Bay, South Africa. Photo courtesy of Craig Findley. Due to their preference for nearshore waters on calving and nursing grounds, their relative approachability and their sometimes acrobatic behaviour, southern right whales are a popular target for whale watching. They are the focus of whale watching tours in several Southern Hemisphere locations, including Australia, South Africa, and Argentina. Studies have shown that right whales can be negatively impacted by whale watching activities19 and as such southern right whales are protected by whale watching guidelines in all three of these countries. Due to the extreme vulnerability of endangered North Atlantic right whales, United States’ federal law stipulates that vessels must maintain a minimum distance of 500 yards (approximately 500 m) from these whales, even if vessels are allowed to approach other species, like humpback whales to within 100 feet (approximately 30 m). As such, although it is possible to observe the species from a long distance during whale watching tours off the east coast of the US, it is not conisdered a target for whale watching activities. Southern right whales in Argentina. Photo courtesy of Chris Johnson. Kenney, R.D., Right whales: Eubalaena glacialis, E. japonica, and E. australis, in Encyclopedia of Marine Mammals, B. Würsig, J.G.M. Thewissen, and K.M. Kovacs, Editors. 2017 (in press), Academic Press, Elsevier: San Diego. Baumgartner, M.F. and B.R. Mate, Summertime foraging ecology of North Atlantic right whales. Marine Ecology Progress Series, 2003. 264: p. 123-135. Brown, M.W., et al., Sighting heterogeneity of right whales in the western North Atlantic: 1980-1992. Journal of Cetacean Research and Management, 2001. Special Issue 2: p. 245-250. Rowntree, V.J., R.S. Payne, and D.M. Schell, Changing patterns of habitat use by southern right whales (Eubalaena australis) on their nursery ground at Península Valdés, Argentina, and in their long-range movements. Journal of Cetacean Research and Management, 2001. Special Issue(2): p. 133-143. Frasier, T.R., et al., Sources and rates of errors in methods of individual identification for North Atlantic right whales. Journal of Mammology, 2009. 90(5): p. 1246–1255. Baumgartner, M.F. and B.R. Mate, Summer and fall habitat of North Atlantic right whales (Eubalaena glacialis) inferred from satellite telemetry. Canadian Journal of Fisheries and Aquatic Sciences, 2005. 62(3): p. 527-543. Mate, B.R., et al., Coastal, offshore, and migratory movements of South African right whales revealed by satellite telemetry. Marine Mammal Science, 2011. 27(3): p. 455-476. Knowlton, A.R., et al., Monitoring North Atlantic right whale Eubalaena glacialis entanglement rates: a 30 year retrospective. Marine Ecology Progress Series, 2012. 466: p. 293-302.
van der Hoop, J.M., et al., Predicting lethal entanglements as a consequence of drag from fishing gear. Marine Pollution Bulletin, 2017. 115(1–2): p. 91-104. 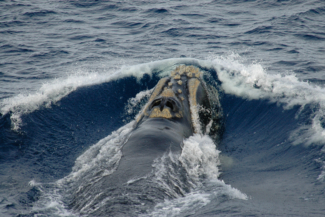 Hoop, J.M., et al., Vessel strikes to large whales before and after the 2008 Ship Strike Rule. Conservation Letters, 2014. Fazio, A., M. Bertellotti, and C. Villanueva, Kelp gulls attack Southern right whales: a conservation concern? Marine Biology, 2012. 159(9): p. 1981-1990. Reeves, R.R. and T. Smith, A taxonomy of world whaling, in Whales, whaling, and ocean ecosystems, J. Estes, et al., Editors. 2006, University of California Press: Berkeley, California. p. 82-101. Wade, P.R., et al., The world's smallest whale population? Biology Letters, 2010. 7: p. 83-85. Pace, R.M., P.J. Corkeron, and S.D. Kraus, State–space mark–recapture estimates reveal a recent decline in abundance of North Atlantic right whales. Ecology and Evolution, 2017. Cooke, J., V. Rowntree, and R. Payne, Estimates of demographic parameters for southern right whales (Eubalaena australis) observed off Península Valdés, Argentina. J. Cetacean Res. Manage, 2001. Special Issue(2): p. 125-132. Groch, K., et al., Recent rapid increases in the right whale (Eubalaena australis) population off southern Brazil. Latin American Journal of Aquatic Mammals, 2005. 4(1): p. 41-47. Argüelles, M.B., et al., Impact of whale-watching on the short-term behavior of Southern right whales (Eubalaena australis) in Patagonia, Argentina. Tourism Management Perspectives, 2016. 18: p. 118-124.